At first I assumed it was written by the person who sent it to me, and I was disheartened to think so. Then I wondered whether the “I” in the story was someone else and it had been forwarded. Finally I suspected that this story was completely constructed and intended to go viral so this morning I did a Google search on the first line of the story, and found 445 matches. Gotcha! Even though I am trained as a a poet, a writer, a teacher and a critic not to assume that the “I” is the writer, I got caught assuming that the writer of the story was the person who sent it to me. Yes, 445 matches for the exact wording, most of the postings from the past few days. It can be found on a variety of sites and message boards, some listed below, generating both laudatory comments like “you’re awesome” and many people who have found this an excuse to just not tip their servers at all to people who are questioning this action and line of reasoning. During the time it took me to create this post, more turned up, and this one will add to the cacophony in the echo chamber of modern politics. This story has gone viral in more ways than one. Is this the world we want to live in? On Thursday October 16, from 12:30-1:20pm, poet and blogger Gwendolyn Alley (aka Art Predator) will give a reading, discuss process, practice, craft, and approaches to writing for Kelly Peinado’s Introduction to Poetry Class in J-3 Ventura College on Telegraph Road between Day Road and Ashwood in Ventura. She will bring broadsides ($7-10) first published in ArtLife Limited Editions and books including between sleeps: poems from the 3:15 experiment 1993-2005 ($12) which she and Danika Dinsmore co-edited in 2006 (en theos press). From 1996-2004, Alley published three dozen poetry and art broadsides in ARTLIFE Limited Editions; several of these works are published also at http://www.art-life.com/. Alley has participated in the 3:15 experiment since 2001, and in 2007, she facilitated the Experiment . Many of her 3:15 Experiment poems can be found at http://315experiment.com/. Alley’s primary blog is the Art Predator: http://artpredator.wordpress.com; she also participates in the collaborative experimental poetry site, The Orchid Room. Her youtube channel is http://www.youtube.com/user/theartpredator. 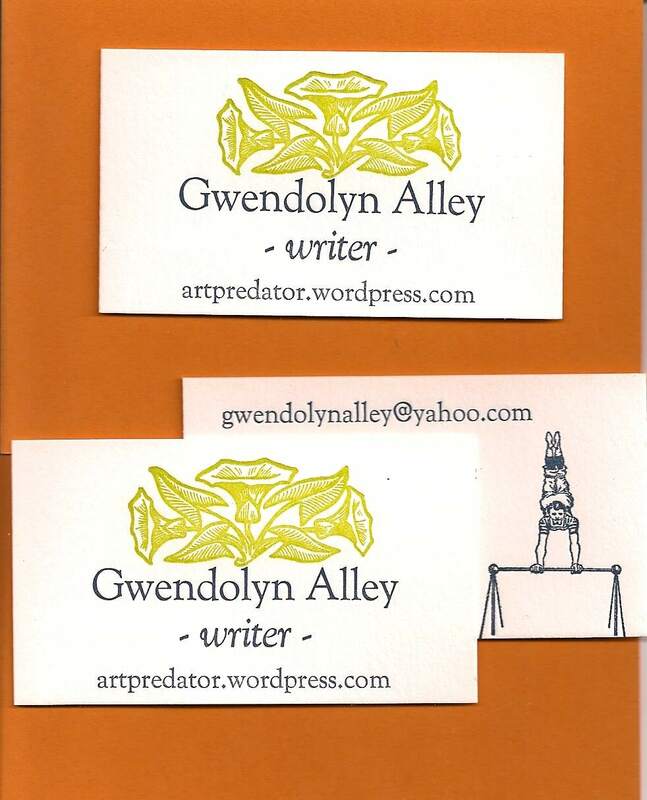 The eclectic Art Predator site includes many of Alley’s ArtLife broadsides, 3:15 poems, an on-going collection of her own spoken word videos with music and images, as well as adventures in wine, travel, and song. Among the 10 poets and writers he named in 1991 as having influenced his work and were his close friends, he named Raymond Carver, Wendell Berry, Galway Kinnell, Denise Levertov, Henry Rago, JV Cunningham, George Dennison, David Budbill, Adrienne Rich and Carolyn Kizer. Look for poems by Ray Carver and by Wendell Berry on this blog.